When looking at long term capital growth, no one knows the future, but the past can be an excellent guide. The ROI (Return on Investment) is therefore an amazing 743% over 25 years. Using a shorter time frame, the past 15 years, your return on investment would have been 488%. 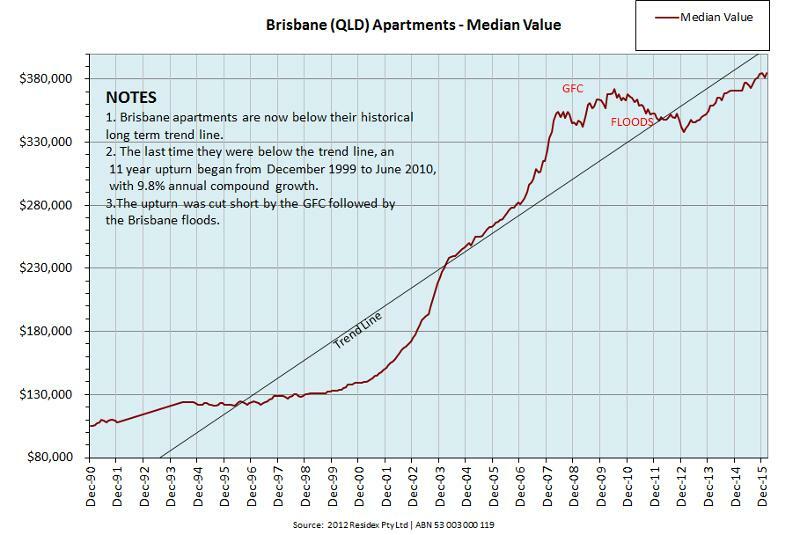 According to the long term trend line Brisbane apartments are currently well below their trend line meaning this could be an excellent time to secure a good long term investment. And if you do secure an apartment and for some reason the market only performs half as well over the next 15 YEARS as it has done in the past 15 years, you’ll still make over 240% return on your own capital in 15 years.